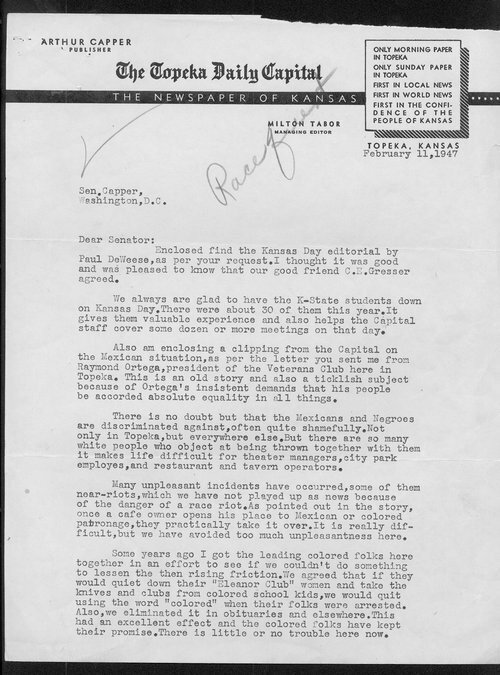 In this letter to Senator Capper, Milton Tabor, managing editor of The Topeka Daily Capital, addresses the on-going race relations problems in Topeka in the years immediately after World War II. In fact, Tabor claims that "many unpleasant incidents have occurred, some of them near-riots, which we have not played up as news because of the danger of a race riot." In addition, Tanor informs Capper, who was the publisher of The Topeka Daily Capital, that the ongoing debate over alcohol was growing contentious and promised to turn into "another knock-down-and-drag-out battle over liquor."